“Received a Dresdner Stollen last Christmas and loved it, it is so delicious I will order to give as gifts next Christmas and get one for myself!" The Christmas cake known as Stollen was first baked in Dresden, Germany around 1450. Stollen is traditionally a dry, but very flavorful cake. Hand made in Emil Reimann's Backerei in Dresden, Germany and affixed with a seal of quality from the Dresdner's Baker's Guild. This cake is one of the richest of rich German cakes – made with fresh butter, eggs, raisins and candied fruit. A cherished German sweet Christmas holiday cake. Some say the dusting of powdered sugar on the cake is meant to represent the Christ Child in swaddling cloths. This 26.4 ounce stollen serves 10-12 and comes in a decorative box. German pastries, such as stollen are a bit drier than American style cakes. To make your stollen moister simply toast lightly and spread with soft butter. For a little added sweetness, sprinkle with extra powdered sugar (packet included) . Also comes with storage bag that matches the box. Emil Reimann Original Dresdner Stollen marks the legendary holiday cake served during the Christmas Holiday season. Dating back to the 14th century, to bear the name Dresden, the stollen must be baked in or around Dresden, Germany. 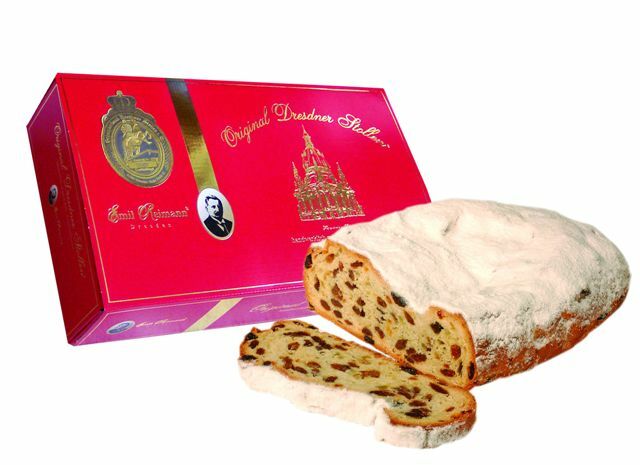 Award winning Original Dresdner Stollen are packaged in handsome gift boxes. Classic, timeless, yummy goodness! This golden brown sour cream coffee cake is a customer favorite and has been our best selling coffee cake for years. It’s deliciously moist and baked to perfection, using fresh farm eggs, sour cream and pure Bourbon Vanilla. Then it’s generously laced with cinnamon streusel and whole walnuts. The CoffeeCakes.com Traditional Cinnamon Walnut Coffee Cake defines comfort food and makes a great gift for giving and entertaining. It’s trans fat free and contains no artificial coloring, artificial flavoring or preservatives. Serves approximately 10 – 12 people. The secret to Grandma’s Classic Fruit & Nut Cake is a combination of ripe fancy cherries, fresh succulent pineapples, golden raisins, crunchy almonds, seedling pecans, English walnuts and just the right amount of bonded American bourbon, imported brandies and rum. This Original Fruit and Nut cake is moist and a beauty to behold. Grandma’s Original Fruit and Nut two-pound ring cake serves 7-8 generously and will keep for at least six months if stored in a cool, dry space. If opened reseal lightly in plastic and store in the refrigerator. A rich dark fruit cake from the dedicated monks at the Assumption Abbey Trappist monastery in Ava, Missouri. This fruit cake is one of our favorites. Striking a perfect balance between cake, nuts, fruit and rum, this fruit cake doesn’t have too much of any one thing. Two pound fruit cake serves 7-8. This cake makes a great gift, the cake is presented in a tasteful white tin with a picture of the Trappist Monks on the label. Shop Now, Ship Later! At checkout you can specify your ship date for any date in the future. Stollen is a German tradition. It’s a sweet, fruit-filled bread made to celebrate the holidays. We’ve taken this German classic and paired it with a classic ingredient – cranberries. Slice into this cake and discover the simple beautify of these brilliantly hued red berries. Taste the subtle bite of tartness from the cranberries and the sweetness from the candied orange and luscious marzipan (almond) filling in our Cranberry Stollen. Kuchenmeister has been making stolen since 1884 and continues to bake with traditional methods using only the finest ingredients. Consider this your ticket to a worldly delight! This delicious black forest cherry liqueur stollen has 11% luxury marzipan filling, 10% candied cherries, 2% cherry brandy (50% vol) and 5% marzipan in the dough to make a delicious holiday favorite! For traditional Stollen baking, Kuchen Meister leads the way in the creation of this sweet 28 oz holiday favorite. Black Forest stollen comes in a colorful festive holiday gift box. Product of Soest, Germany. My Grandma's of New England's Coffee Cakes define traditional coffee cakes. These cinnamon walnut coffee cakes are based on a rich egg and sour cream coffee cake batter with additional distinctive flavorings. Selections for the Custom Coffee Cake Sampler include Cinnamon Walnut, Granny Smith Apple, Blueberry, Ted Williams All Star Chocolate, Lower Fat Cinnamon Walnut, No Walnut Cinnamon, Golden Raspberry and Cape Cod Cranberry Coffee Cakes. My Grandma’s coffee cakes stay fresh on the counter for a week or can be frozen up to four months. Kosher Certified and contains no trans fats, artificial flavoring, artificial coloring or preservatives! Excellent value-any three coffee cakes for one low price! 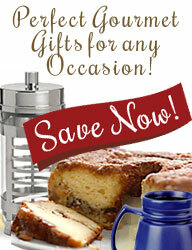 Enjoy our baked in the USA products!